SEAN O’Loughlin is itching to get back on the field to dilute the pain of the year’s Grand Final defeat. The England captain will lead his country against France at Leigh Sports Village on Saturday, with four Warriors’ team-mates also in the squad. Whichever side they sent this year, it’s a good chance for us to get a series win. John Bateman, Joe Burgess and George Williams could all make their England debuts, while Liam Farrell completes the club’s representation. And ahead of their three-match Test Series against New Zealand, O’Loughlin believes this is a perfect chance to realign their focus after Wigan’s loss at Old Trafford. “We had a couple days off after the Grand Final, and this is a nice distraction,” said O’Loughlin. “When you lose a final, the first thing you want to do is play again, and this gives us a chance to do that. Warriors’ scrum-half Matty Smith has not been named in Saturday’s squad, while Sam Tomkins hasn’t fully recovered from a knee injury. 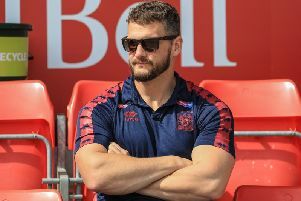 O’Loughlin is one of just three surviving members (with James Roby and James Graham) from the triumphant national squad which beat New Zealand 3-0 in 2007 - the last series under the Great Britain banner. Like then, this current Kiwi squad has been rocked by a string of high-profile withdrawals including Shaun Johnson, Keiron Foran and captain Simon Mannering. Thomas Leuluai and Benji Marshall also miss out for the Tests in Hull, London and Wigan on successive weekends from November 1. “We can’t concern ourselves about who has or who hasn’t come over,” added O’Loughlin. “Whichever side they sent this year, it’s a good chance for us to get a series win.